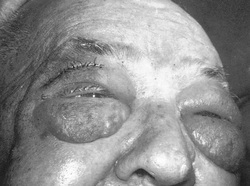 People who suffer from waldenstrom macroglobulinemia may present with signs and symptoms such as anemia, loss of weight, weakness, fatigue, lymphadenopathy, enlargement of the liver and the spleen ( hepatosplenomegaly), bleeding, retinal vascular dilation with impairment of the vision, neurological abnormalities and cold agglutinin disease. Pathologically peripheral blood smear of the patient with waldenstrom macroglobulinemia may present with rouleax formation of the erythrocytes. Waldenstrom macroglobulinemia is also known as hyperviscosity syndrome mostly due to IgM producing plasmacytic lymphocytes. This is a hybrid between B lymphocytes and plasma cells. Laboratory investigation may reveal increased in the serum viscosity, monoclonal IgM spike on the electrophoresis of the serum protein and decreased in the Hgb. There will be a mixture of small lymphoid cells with different degree of differentiating plasma cell present in the bone marrow. There will also be a eosinophilic inclusion bodies in the cytoplasm ( Russell bodies ) and the present of Dutcher bodies ( eosinophilic inclusion bodies in the nucleus). Waldenstrom macroglobulinemia is commonly affecting older men and the treatment recommended is periodic plasmapheresis and autologous stem cell transplantation. 1.Dimopoulos, Meletios A., Panayiotis Panayiotidis, Lia A. Moulopoulos, Petros Sfikakis, and Marinos Dalakas. “Waldenström’s Macroglobulinemia: Clinical Features, Complications, and Management.” Journal of Clinical Oncology 18, no. 1 (January 1, 2000): 214–214. 2.Dimopoulos, Meletios A., Robert A. Kyle, Athanasios Anagnostopoulos, and Steven P. Treon. “Diagnosis and Management of Waldenstrom’s Macroglobulinemia.” Journal of Clinical Oncology 23, no. 7 (March 1, 2005): 1564–1577. doi:10.1200/JCO.2005.03.144.